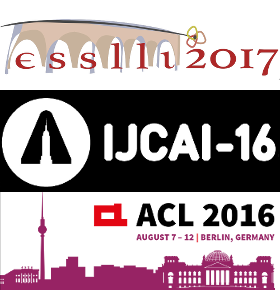 Members of the Centre are delighted to have been able to contribute to tutorials not only at both IJCAI 2016 in New York and, a couple of weeks later, at ACL 2016 in Berlin, but also, the following year, at ESSLLI 2017 in Toulouse. Katarzyna Budzynska delivered a tutorial on Argument Mining at IJCAI 2016 on 11 July 2016 with Serena Villata; whilst Chris Reed delivered a tutorial with Iryna Gurevych, Noam Slonim and Benno Stein, on NLP Approaches to Computation Argumentation at ACL 2016 on 7 August 2016. Katarzyna Budzynska and Chris Reed delivered a 5-day course on Argument Mining at ESSLLI in Toulouse, 17-28 July 2017. If you are interested in argument mining and related topics, do take a look at the websites and consider joining us at ESSLLI.